This article is about the Promethean Knight class. For the biological Forerunner, see Strategos. Knight Strategos are a class of Promethean Knight present within the UNSC's Warzone simulation. 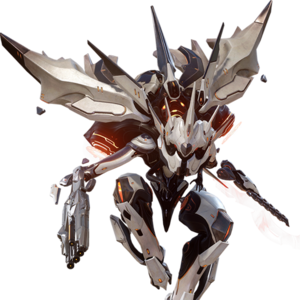 In Warzone simulations, Knight Stategos has the same appearance as a Knight Commander, thus Strategos has the hardlight blade they do, has several spikes sticking up from behind its head, and sports a white color scheme. Strategos also wields a Z-390 incineration cannon. In Warzone, Strategos appear in as a boss unit. Killing one will award the team 150 VP, and earn the player a Legendary Takedown medal. A Knight Strategos being engaged by a Spartan-IV. A Knight Strategos on Escape from ARC. A Knight Strategos with several Soldiers on Escape from ARC.